If you’re a sports fan, of course you want to participate in festivities related to the Big Game. The good news is that, according to the American Association of Diabetes Educators (AADE), there is no reason why people with diabetes can’t attend the festivities and have a great time, as long as they take some extra care. Planning in advance and keeping moderation in mind will both go a long way toward helping you enjoy the fun without sending your blood sugar into overdrive. Eat a balanced breakfast the morning of the game that includes your usual foods, such as whole grains and fruit. Consider adding an additional higher protein food, such as eggs or a serving of Greek yogurt. Milk and eggs are considered major allergens, so if you have an allergy, make sure to look for dairy- or egg-free alternatives. Fill yourself up beforehand so you don’t arrive at the party extra hungry. It’s tough to make smart food choices when you’re famished. Make sure to stick to your normal exercise schedule. Even if it’s just taking a lap or two around the block, exercising can help keep your blood sugar levels in check. Bring items to the party that you like and that you know fit your health and nutrition goals. For example, you might consider taking vegetables served alongside hummus and a yogurt-based dip, fresh fruit and unsalted nuts, or mini turkey sandwiches on whole grain bread. But remember: tree nuts, peanuts, and wheat are also considered major allergens, so be mindful of any food allergies when bringing a dish to share. Plan to drink plenty of non-alcoholic beverages to stay hydrated. For every alcoholic beverage, have at least one to two glasses of water or unsweetened tea. Know your limit and don’t drink excessively. Alcohol can cause a drop in blood sugar levels because it blocks the production of glucose in the liver, thereby leaving you feeling woozy even before the effects of the alcohol kick in. Most people with well-controlled diabetes can enjoy moderate amounts of alcohol, which the National Institutes of Health defines as no more than one drink per day for women and no more than two drinks per day for men. However, even this is too much for some people, so if you normally don’t drink, a big social event like this one is not a good time to start. Ask your doctor if you have questions about whether you can safely drink alcohol. 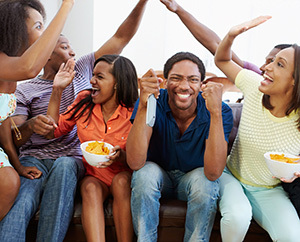 With a little planning and a sensible approach, football season's biggest party can be both enjoyable and tasty for people with diabetes.